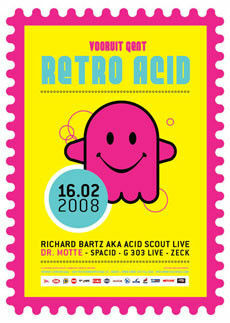 Retro-Acid is Kozzmozz’ second oldest concept and celebrates the infamous Roland TB-303 bass machine. Thé party for the fans of the 303 and it’s unmistakable Acid sound, the machine that formed and shaped electronic music and keeps influencing it. It surely did so in the early days when we loved to dance to it ! And the current Acid revival proves that we still do today ! First up is Dr. Motte who not only organized his first acid house party in 1989, during the famous “Summer of Love” but he’s also the man responsible for the huge success of the now worldwide organized Love Parade. This first demonstration for Love, Peace & Electronic Music started out with 150 participants in 1989 to grow to over 1.500.000 dancing people more than 10 years later. Dr. Motte also released the various Love Parade anthems with Westbam on Low Spirit Recordings and runs his own label and clubnights “Praxxiz” in Berlin. Second up is another German producer, this time from Münich who we know best as Richard Bartz who’s produced albums for Cocoon and EFA. But he’s also a great acid connoisseur under his alias “Acid Scout” with albums such as “Musik fur Millionen” and “Safari”. As Richard Bartz he has just released a new full live album that’s also a dvd and that’s composed of his live-set at the Harry Klein club in Münich. He will spice his live up with special acid effects for this Retro Acid party. Our resident Spacid has played a lot of major clubs in Belgium and abroad ( Weekend Club – Berlin, The Key and Trash – Uk , Paradiso and Melkweg – Nl , … ) but he’s still at his best at home ! Two underground dj’s and producers from Belgium will join them. G303 who’s releases we can find on Subcom Records and Animal Trax has a lot in store for us in 2008 as records on Stoorzender rec, Binary Bassline, Kugelbox rec are to be expected. He will give us a preview in his full blown acid live set. And Zeck who’s earned his stripes with the Mutate Crew and the 7days festival in Ghent will bring one of his famous acid dj sets. Acid in the house !!!!! !